You can help prevent unauthorized users from opening a document or from modifying a document even if they have permission to open it. Caution: When you create a password for a document, write down the password and keep it in a secure place. If you lose the password, you can't open or gain access to the password-protected document.Passwords in Excel for Mac and Word for Mac have a 15-character limit. You cannot open a workbook or document that has been password protected in the Windows-based version of Excel or Word if the password is longer than fifteen characters. If you want to open the file in Office for Mac, ask the Windows-based author to adjust the password length. Word doesn't encrypt the data that is hidden in a document. Given sufficient time and knowledge, a user can modify data in any document that he or she has access to. To help prevent modification of data, and to help protect confidential information, limit access to any Word documents that contain such information by storing documents in locations available only to authorized users. Open the document that you want to help protect. Under Personal Settings, click Security . In the Confirm Password dialog box, type the password again, and then click OK. Tip: To remove a password, select all contents in the Password to open box, and then press DELETE . You can add a password so that only authorized users can make changes to a document. 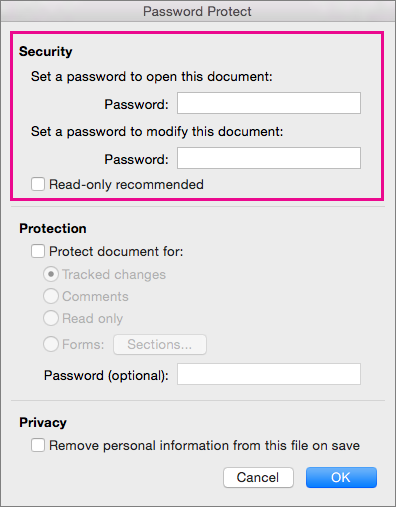 Users who are not authorized to change a document can still open the document and then save it by using a different file name. Tip: To remove a password, select all contents in the Password to modify box, and then press DELETE . As part of preparing a document for review, you can specify that others can change the document by inserting comments only, or by inserting comments and tracked changes with revision marks. For added security, you can assign a password to ensure that users do not remove this type of protection. On the Review tab, under Protection, click Document. Ensure that all changes are tracked so that you can review them. Users cannot accept or reject changes, or turn off change tracking. Open the document that you want to change the password for. In the Password to open box or Password to modify box, select all contents. Type the new password, and then click OK. Tip: To remove a password, select all contents in the Password to open box or the Password to modify box, and then press DELETE .